An allergen is a substance that causes an allergic reaction. Allergens affect only some people, and these people are said to be allergic to that specific substance. Not all allergens are biological hazards, but the most important ones are. Allergic reactions to food may occur as soon as the food is eaten or, in some cases, merely touched, or they may not occur until hours after the food is eaten. Common symptoms of allergic reaction to foods include itching, rash or hives, shortness of breath, tightness in the throat, and swelling of the eyes and face. In severe cases, allergic reactions may lead to unconsciousness or death. 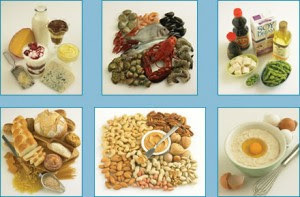 Foods to which some people are allergic include wheat products, soy products, peanuts and other nuts, eggs, milk and dairy products, fish, and shellfish. Non-biological allergens include food additives such as nitrites, used in cured meats, and monosodium glutamate (MSG), often used in Asian foods. Because these products are common and are perfectly safe for most people, it is difficult to avoid serving them. For the sake of people who are sensitive to these foods, food service personnel, especially all dining room staff, must be well informed of the ingredients in all menu items and be able to inform customers as needed. If any staff member does not know, when asked by a customer, if a food might contain an allergen, that employee should tell the customer so and then find someone who does know or else urge the customer to order a different item.